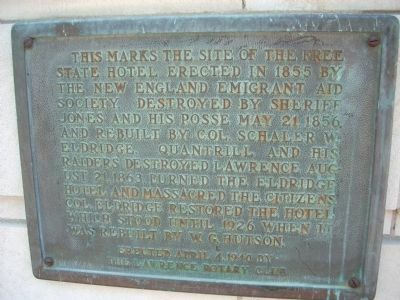 This marks the site of the Free State Hotel erected in 1855 by the New England Emigrant Aid Society. Destroyed by Sheriff Jones and his posse May 21, 1856, and rebuilt by Col. Schaler W. Eldridge. Quantrill and his raiders destroyed Lawrence August 21, 1863, burned the hotel and massacred the citizens. 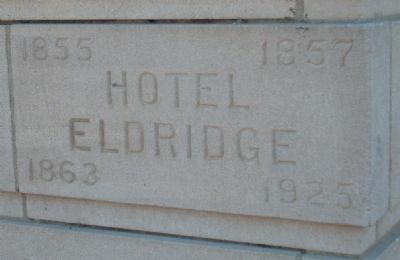 Col. Eldridge restored the hotel which stood until 1926 when it was rebuilt by W.G. Hutson. Erected 1940 by Lawrence Rotary Club. Location. 38° 58.265′ N, 95° 14.171′ W. Marker is in Lawrence, Kansas, in Douglas County. Marker is at the intersection of Massachusetts Street and 7th Street, on the left when traveling north on Massachusetts Street. Touch for map. 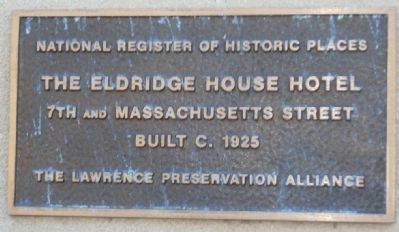 This marker is along Massachusetts Street halfway along the building. 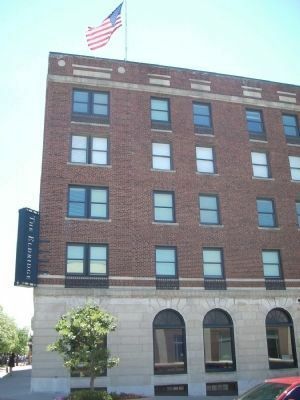 Marker is at or near this postal address: 701 Massachusetts Street, Lawrence KS 66044, United States of America. Touch for directions. shouting distance of this marker); Miller's Hall (within shouting distance of this marker); John Brown and the Siege of Lawrence, September 14-15, 1856 (about 300 feet away, measured in a direct line); Lawrence Studio (about 300 feet away); The First Lawrence U.S. Post Office (about 300 feet away); House Building (about 400 feet away). Touch for a list and map of all markers in Lawrence. Regarding Free State Hotel. When the Free State hotel was captured, the male occupants were escorted under a flag of truce to a safe location and survived the raid - per the instructions of William Quantrill himself. 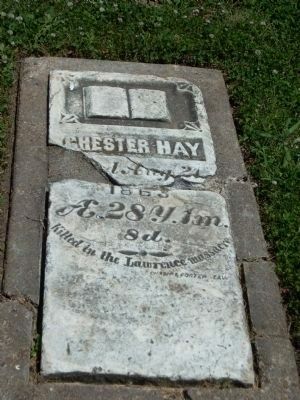 Chester Hay - victim of the Lawrence Massacre. Mr. Hay is buried in the Pioneer Cemetery which is now on the campus of the University of Kansas. 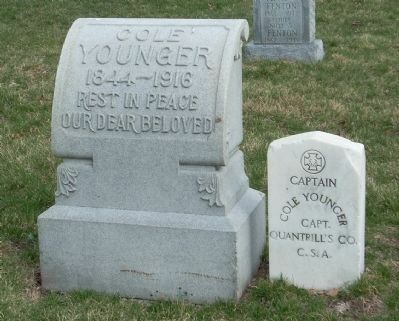 Cole Younger is buried in the Lee's Summit, Mo. Cemetery. - He rode with Quantrill during the Lawrence Raid. 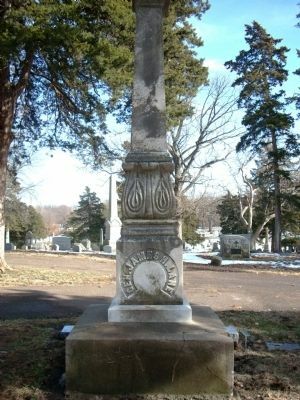 James Lane is buried in Oak Hill Cemetery in Lawrence, Ks. His name was among 12 that appeared on a "death list" of prominent figures that the rainding figures were after. Stories have it that James Lane either escaped in an outhouse or in a cornfield. More. Search the internet for Free State Hotel. Credits. This page was last revised on June 16, 2016. This page originally submitted on June 30, 2009, by Thomas Onions of Olathe, Kansas. This page has been viewed 1,332 times since then and 5 times this year. Photos: 1, 2, 3, 4, 5, 6, 7. submitted on June 30, 2009, by Thomas Onions of Olathe, Kansas. • Craig Swain was the editor who published this page.